If you've studied the MAX function, you know that there's an easy way to find the maximum value in a range or series of numbers. But what if you want to find the minimum value? 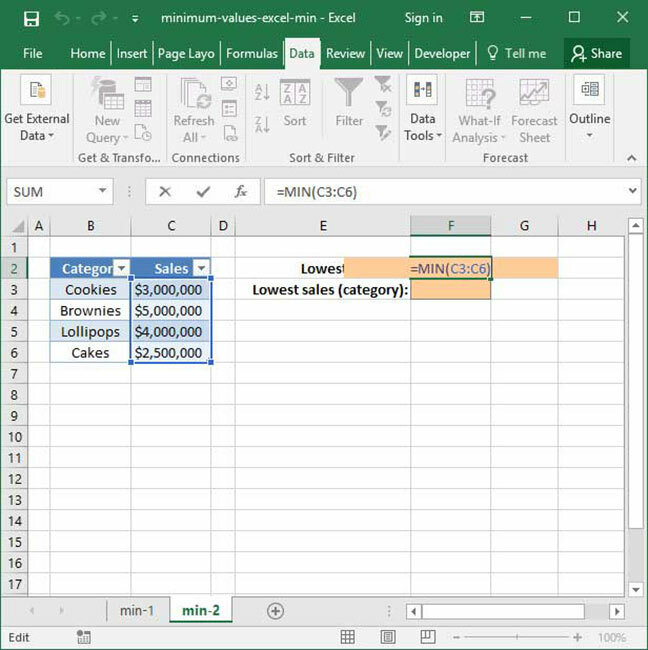 It turns out that finding minimum values is easy with Excel's MIN function. MIN works just like MAX — it takes a series of numbers or a cell range as an input, then evaluates everything inside and spits out the minimum value it sees. Keep reading to find out more about how to use the MIN function. There are a couple of things here to be aware of: first, MIN accepts either a series of numbers, or a range of cells as its arguments. Second of all, it can take an unlimited number of arguments. Like MAX, it will evaluate all of its arguments and spit out only the number that is smallest amongst them. The value output here is 6, because 6 is the smallest argument provided to the function. The output here is -45, because -45 is the minimum value provided in the formula. Above, we test the MIN function on the range C3:C6 to find the lowest value contained within its cells. The output of the formula is $2,500,000, because $2,500,000 is the minimum value found in the range provided. If you want to learn more about how INDEX MATCH works, check out our INDEX MATCH primer. When else can we use MIN? Questions or comments on this article? Let us know in the Comments section below!